The city of Lumis used to be known for its soft lights, the endless glow that filled the night. Even after its inhabitants locked it away under a dome it remained, a shining beacon on the horizon. That is until a virus broke out in the system, turning the robots that ran the city against their creators. Twelve years after the War began, humans have been forced into small, unrelenting camps, the largest of which is Fairground. There, a mute medic dreams of breaking free and proving herself; but when she gets the chance, Ash learns that being a hero isn't all it's cracked up to be. When she's separated from her comrades and finds herself in a strange new community, she's forced to change - or die. 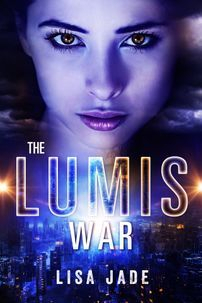 The Lumis War is my first novel release. It's a sci-fi heavy narrative set in an enclosed, post-apocalyptic setting. So far it's been very well received, though I do hope to build on it by working on the sequel! This book is amazing. Not my usual genre to read but would recommend this to everyone. Great for all. What a great heroine, fully developed and quite complex. Sure hope Miss Jade does a follow-up to the story. I want to reconnect to the people of Lumis!! !